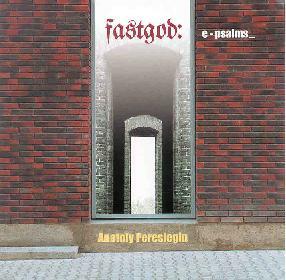 Anatoly Pereslegin - "Fastgod: e-psalms"
As with his previous release - Download The God - Anatoly Pereslegin draws on the Bible for his theme, this time basing his work on David's psalms. Pereslegin handles all the keyboard duties with help from Alexander Zagorinskiy on cello and guest vocalists. An intense avant-symphonic feel prevails throughout, along with operatic segments as Pereslegin makes full use of his guest vocalists (though I really dig the Hawkwind-like robotic voice sequence). He also uses the quirky patterns that were a trademark on Download The God. The pace typically moves along at a steady desperate clip with multiple keyboard and percussion constructions running alongside one another. The atmosphere is darkly orchestral and the vocalists are often responsible for adding the experimental elements to the music. We're also treated to more ambient symphonic segments combined with playful keyboards that communicate a sense of lightness to the overall intensity. Kind of like a mixture of the Residents and Laurie Anderson backed by an avant-garde symphony. I also hear shades of early Tangerine Dream and Ash Ra Tempel, though Pereslegin is more composed than freeform exploratory. But overall, it's the fast pace and continually shifting themes that kept my attention throughout the CD's 75 minute length. I was also impressed with Pereslegin's ability to straddle the line between avant-garde orchestration and symphonic keyboard driven progressive rock. LOTS to hear on this recording. Electroshock CD's are distributed in the US by Eurock. You can visit their web site at: http://www.eurock.com. Contact via snail mail c/o Eurock; PO Box 13718; Portland, OR 97213. Worldwide distribution is also handled by the Gamma-shop at: http://www.studio7.hotbox.ru.